Specifically developed for public libraries, Britannica Library contains comprehensive information for all ages. With its junior, student and adult interfaces, this award winning online learning resource lets library users of all abilities access comprehensive and interactive e-learning information. With differentiated, age-appropriate content, readers can access resources that are engaging and safe. Britannica Library’s Subject Browse tool covers numerous topics including arts, humanities, science and maths. Library members can access Britannica Library 24 hours a day on their home PCs, laptops, tablets and smartphones using their library card. Additionally, users can save research in their personal ‘My Britannica’ account making it the comprehensive resource for every library user. How will Britannica Library support library members? How do you cater for different reading and English-language abilities? Do I need to be a member of my library to access Britannica Library? Can I copy or reuse content in my own work? Can I use Britannica Library from my personal computer or personal mobile device? Can I use Britannica Library from a school computer? How can we integrate Britannica Library? How will the Britannica team support my subscription? How will Britannica Library support library members? 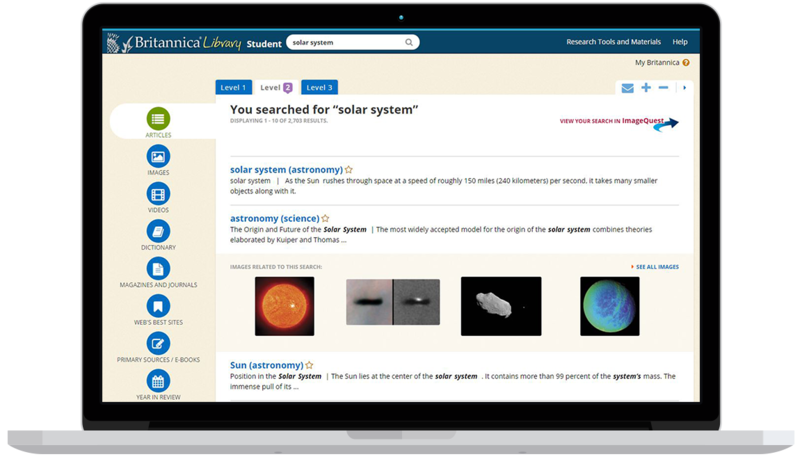 A subscription to Britannica Library gives your members access to online resources which they can use to conduct research, complete school assignments, work on special projects or explore their unique interests. How do you cater for different reading and English-language abilities? Users can choose from three learning levels — Junior, Student and Adult — and select a reading level that matches their ability. Users can adjust an article’s complexity while maintaining the age-appropriate look and format of the page. Do I need to be a member of my library to access Britannica Library? Not necessarily. Britannica works with each library to set up internal and remote access, so it is best to check directly with your library. Signing up to your local library is usually free. Can I copy or reuse content in my own work? All Britannica content is royalty-free and cleared for copyright on the condition that it is being used for an educational, non-commercial purpose. You may not remove or alter any copyright, trademark, service mark or other legends or proprietary notices. Can I use Britannica Library from my personal computer or personal mobile device? Britannica Library is available anywhere, on any device and adapts to fit your screen. Check with your local library to find out more about accessing remotely. Can I use Britannica Library from a school computer? You may not access Britannica Library from within a school. The licence between a public library and Britannica is solely for use within a library or from a personal computer or mobile device and it is illegal to access Britannica Library from within a school environment. We offer an alternative product – Britannica® School – which is specifically designed for schools and has additional features such as lesson planning, teaching resources and classroom activities. How can we integrate Britannica Library? A subscription to Britannica Library allows for access from the library and at home. Britannica will work with your library to find the best access solution. For further technical support, please contact Britannica on +44 (0)20 7500 7800. This service is available Monday through Friday from 9am to 5pm UK time.